I am writing from Vancouver. I arrived last Saturday and am settling in. Settling in because I will be working and blogging from here for the next few months. During this time, I hope to discover, eat and review some interesting food destinations. I was in Vancouver a year ago to visit family and friends. The first thing I did on my last visit--directly after I came into the city from the airport--was to have a pistachio affogato from Mondo Gelato. On this trip it took as long as a day before I had this tasty dessert. An affogato is a simple Italian dessert: espresso poured over top of gelato. With simple desserts, the quality of the ingredients are often what makes them good. The better the espresso and the gelato, the better the affogato. For people who like espresso and gelato, a good affogato is a must! I don't drink coffee often: possibly a cup once or twice a year. I love the smell of coffee, but drinking it just makes me hyper and jumpy. For me, being more hyper just results in a melt down. So, it sometimes seems odd to me that I like the combination of espresso and gelato so much. Over the years I have had many flavours of affogato. My favourite, however, remains pistachio. The rich roasted flavour of pistachio brings back memories of cracking open roasted pistachios as a child. The nuts were always lightly salted, which helped enhance the subtle nutty flavour. The pistachio gelato at Mondo is the best pistachio gelato (or pistachio ice cream, for that matter) that I have had. I have also made pistachio gelato several times, using various recipes, ingredients and techniques, and I still can't make one that tastes as good as theirs. Because I like Mondo's so much, I seem to try pistachio gelato almost everywhere that I travel. I have also been told that their espresso is excellent by those who are more adept in that area. Mondo Gelato is a chain that has stores in Vancouver, San Francisco, Beijing and Italy. So, if you happen to be in a city with a Mondo Gelato, sit down and try a simple and very satisfying affogato. You might also become hooked. Posted by Sam at 5:53 p.m. Welcome to Vancouver! I hope your stay here is enjoyable; if there is anything I can do/let you know about, pleas don't hesitate to drop me a line. Oh my goodness! Talk about a sugar and caffeine rush...but trust the Italians to do it right. Why do we Americans come up with things like Red Bull? P.S. Hey, can I submit my peach tarte tatin post for your ice cream event - it's got two ice creams! Thanks so much. I am definitely enjoying Vancouver. Congrats on starting a blog. It's fun and addictive. Yes, I have resurfaced. LOL. Thanks. I imagine you would love an affogato Jasmine. I agree, there are just some Italian dishes and desserts that transport you to another place. I'm not sure why Red Bull was made. Please send your tarte tatin post to my email. I would love to include your wonderful ice creams to the round-up. Cheers. Thanks for visiting. I hope you do try this combination together, it is divine. 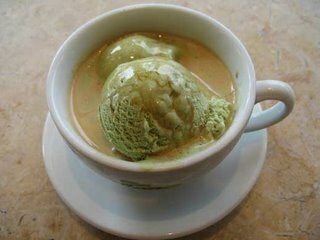 I've had vanilla affogato many times but never pistachio. Where can I get pistachio ice cream at 1:28 a.m. in Toronto??? Oh my goodness. I don't know how I came upon your blog but thank God I did. The first thing I checked out was your pictures and I was mesmerized by every single dessert. I was also kind of jealous because it seemed like I would never be able to try tasting them either. Then I found out you post the recipes to the desserts that you created yourself. I am truly in awe. You are a dessert guru, I am convinced that you should start a dessert cafe in Toronto or something. I would be in heaven. Good luck to your future endeavours! The best pistachio gelato in Toronto can be found at La Paloma Gelateria. They have two types, I recommend the Sicilian pistachio gelato. Thanks for visting and your lovely comments. Dessert guru, I not sure about that, but as you can see, I really do enjoying making desserts. If you're still in Vancouver, this is definitely a good gelatto place--they have over 200 flavours, some of which are quite interesting. My favorite was the pear/blue cheese.